Last year I purchased a Jadelynn Brooke backpack as my bag for the school year. Last week Jadelynn Brooke released three new backpacks for the year and they are too cute! I am going to be talking about what I liked and disliked about mine last year for the people who are unsure about purchasing one. The design of this year's bags are very similar if not the same. This is what my backpack looks like. 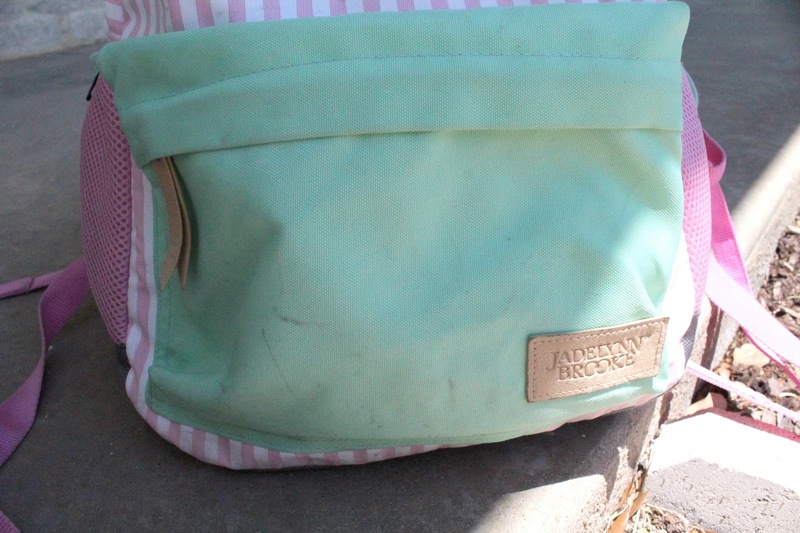 It has pink and white vertical stripes and a sea foam green front pocket as well as sea foam accents. The only thing I didn't like about the backpack over all was the fact that it got dirty so easily/ showed dirt so easily. But that wasn't the company's fault, I was the one who chose this print. While we are on the topic of dirt, these backpacks clean up really quick and easy. I got really large black markings (bicycle grease, if any of you know how hard it is to clean up) on the front pocket and I was a hundred percent sure it wouldn't come out but my dad took a rag and soap and water and it cleaned right off! The backpack can't be purchased with a monogram on it but all of the backpacks have a good amount of space so that you can put your monogram on it. All of the zippers are this leather logo zipper and I love them! My zipper didn't break which is awesome because it seems to happen at least once with my backpacks each year. There is also a flap that covers the zipper. Both sides of the bag have a water bottle holder and one of them has the Happy the buck logo tag. The water bottle holders are a really good quality mesh and mine still look brand new. There is sea foam green trim around the top which is elastic. Here's the back of the backpack. 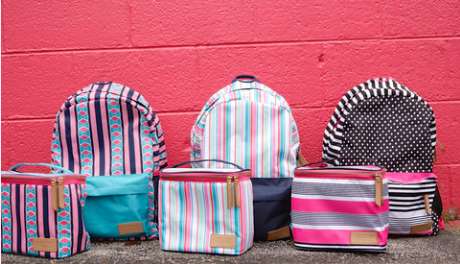 It has two sets of clips so you can clip your backpack to make sure it's secure while wearing it. One set of clips are on the straps them self and move up and down while the other set are at the end of the adjustable part of the strap. There is a loop on each strap, I guess so you can clip things to it. I didn't use mine but the Jadelynn Brooke logo is a loop and the pink strip on the other strap is one as well. The backpack also includes a whistle which is nice. My friends and I used to call each other from the other side of the hall using our whistles, they work great. My only complaint about the construction of the backpack is the carrying handle. Mine broke around the end of first semester. I carry a ton of stuff in my backpack and the strap couldn't hold the weight. I Gorilla Glued my handle back on and it broke again. The flap above the carrying handle is so that you can pull your headphones through there and listen to music while your phone is in your bag. Here is the inside of the backpack. The inside fabric is sea foam green with white polka dots. The bag has a pink Velcro strap at the top and two neoprene pockets. This strap Velcros open and holds your headphones when you aren't using the headphone holder. I didn't use the strap for that but I did store my key ring on there and it kept me from loosing them in my bag. In the back of the bag are two neoprene pockets. The larger one is a computer pocket and the smaller one is for anything else you want to put in there. The smaller pocket was where I put my phone during the day so it is easy to find. Here's what the front pocket looks like. It is sea foam green and it has a leather logo stitched in the corner. There is a flap to cover the zipper and a leather logo zipper. Excuse the dirtiness of it. The front pocket has a leather logo stitched on it in the corner. Here is what the inside of the pocket looks like. The inside of the pocket its self is the same pattern as the inside of the bag and has three pencil holders and a larger net pocket on the left. Behind that pocket is another larger pocket for storing things like your phone or a coin purse. So that is my review on my Jadelynn Brooke backpack. All opinions are honest opinions and I am not being sponsored to post this. I am though, a Jadelynn Brooke rep and you can get 15% off of their backpacks and any other product on their site by using my code SLMHS.